Defiance Acquires MAG Silver’s Za… | Defiance Silver Corp. The Lagartos Project consists of 14 concessions totaling approximately 800 hectares (Figure 1). 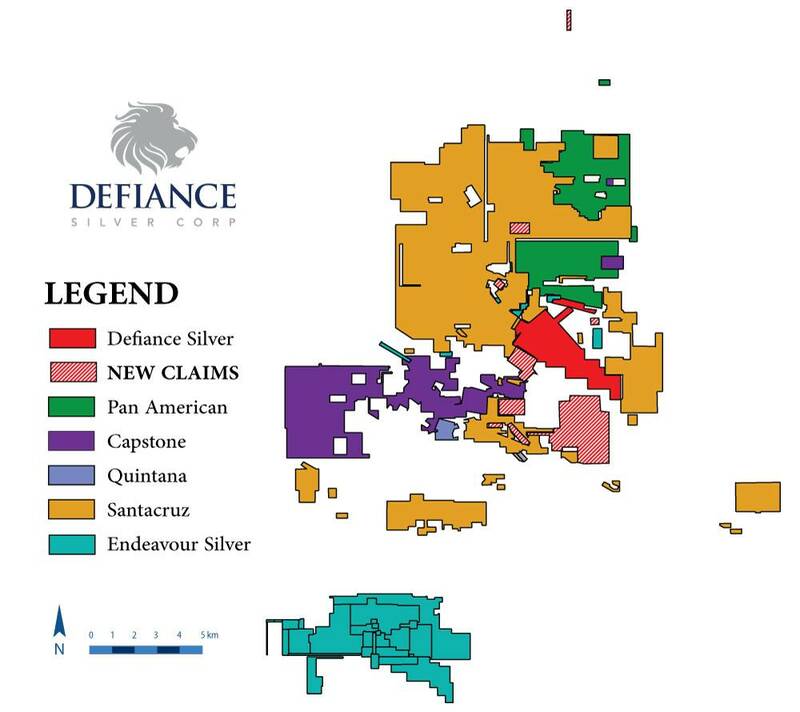 In addition, Defiance will also receive a database covering an additional 135,000 hectares in the Zacatecas silver district providing the opportunity to acquire further concessions. All of the Lagartos concessions are located within the Zacatecas silver district, which has produced an estimated billion ounces of silver, principally before 1895. Zacatecas lies along the “Fresnillo Silver Trend” a regional structural zone that has yielded over 5 billion ounces of silver. The four largest districts along the trend; Guanajuato, Zacatecas, Sombrerete and Fresnillo are all characterized by multiple sets of parallel silver-gold veins with high-grade oreshoots located periodically along their lengths. The Zacatecas District is characterized by six major sets of such parallel veins. This consolidation gives Defiance control of over 65% of the Veta Grande vein, which historically produced a significant amount of silver within the district. A number of the other newly acquired Lagartos concessions lie along other important vein systems in the Zacatecas Silver District including: the Malanoche vein system currently being mined by Capstone Mining Corp.; the Cantera - El Bote vein system; and the Panuco vein system controlled by Santacruz Silver Mining Ltd. and Pan American Silver Corp. It is believed that all the known deposits were found in outcrop 350 to 500 years ago, while new vein systems remain to be discovered. Figure 1.Defiance Silver Current and Newly Added Concessions.